TEXAS CITY, Texas, July 13, 2012 (ENS) – A former hazardous waste disposal site adjacent to wetlands on the shore of Galveston Bay will be subject to a $56.4 million cleanup under a settlement agreement announced today by the U.S. Department of Justice and the U.S. Environmental Protection Agency. The settlement, which is subject to court approval, requires a group of 27 companies to clean up the Malone Services Company Superfund Site in Texas City, Texas. The companies must pay EPA $900,000 towards past and future costs, and reimburse the state of Texas for $796,726 in past costs. Among the companies doing the cleanup work are BP Products North America Inc., Pharmacia (formerly Monsanto), Marathon Oil Company, Exxon Mobil Corporation and BASF Corporation. “Cleanup under todays settlement will address the threat from more than a quarter of a million cubic yards of contamination left behind by the site operators in tanks and in a large unlined earthen basin,” said Robert Dreher, principal deputy assistant attorney general of the Justice Departments Environment and Natural Resources Division. Texas City is a busy deepwater port on Texas’ Gulf Coast, as well as a petroleum refining and petrochemical manufacturing center. 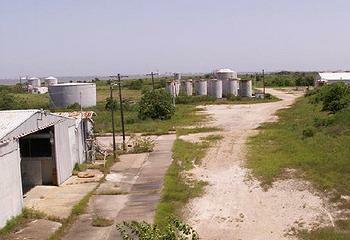 Between approximately 1964 and 1996, the Malone Services Company operated a disposal facility for waste oil and waste chemicals that included acid and caustic compounds, solvents, drilling muds and brines from well workover and exploration activities, acids containing metals from etching and plating operations, contaminated earth and water from chemical spill cleanup operations, as well as gasoline and crude oil tank bottoms. Hundreds of entities sent a total of approximately 481 million gallons of waste to the site. Parties that shipped waste to the site will pay a total of $3.1 million for environmental restoration projects under the settlement. 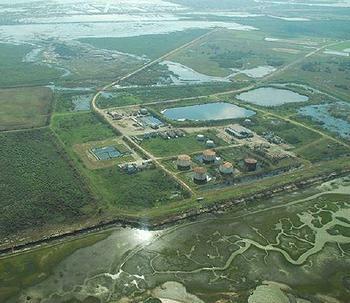 The 150 acre Malone Services site was placed on the Superfund List of the nation’s most hazardous sites on June 14, 2001, based on evidence that hazardous substances from the facility had contaminated the underlying groundwater and migrated to Galveston Bay, a National Estuary and major fishery, and associated wetlands. The Malone Services site is located 1.5 miles from the nearest residential area and an estimated 10,000 people live or work within a three-mile radius. Today, about 260,000 cubic yards of contaminated oily sludge is present in above-ground storage tanks and a multi-acre earthen impoundment. The settlement requires that the oily sludge be solidified and placed, together with contaminated soil, into an on-site containment cell of a design specified by the Resource Conservation and Recovery Act. The EPA says the groundwater will be monitored to confirm that the remedial action is preventing offsite migration. Under the financial terms of the settlement, 76 entities that shipped waste to the MSC site, including the United States and the Texas Commission on Environmental Quality are resolving their liability by paying cash to the group of 27 companies doing the cleanup. The United States, which shipped 1.62 percent of the waste, will pay $1.49 million. The TCEQ, which shipped just 0.00545 percent of the total waste, will contribute only $6,766. EPA previously completed four rounds of administrative settlements with 230 relatively small contributors of waste, collecting $8.4 million. The agency will make at least $4.5 million from these and other recoveries available to the group of 27 companies carrying out the cleanup. The southwestern, southern and southeastern boundaries of the facility border on wetlands. The federal and state natural resource trustees for the site have determined that natural resources associated with upland-woodlands habitat, freshwater-marsh habitat and saltwater-marsh habitat, were injured by contamination. The parties that shipped waste to the site will pay the trustees a total of $3.1 million to implement environmental restoration projects, which will be selected in the future by the trustees and described in a restoration plan on which public comment will be solicited. The trustees are: the National Oceanic and Atmospheric Administration, the U.S. Fish and Wildlife Service, the TCEQ, the Texas Parks and Wildlife Department and the Texas General Land Office. The proposed settlement was lodged today in the U.S. District Court for the Southern District of Texas. The settlement is subject to a 30-day public comment period and final court approval. A copy of the proposed consent decree is available on the Justice Department website at: www.usdoj.gov/enrd/Consent_Decrees.html.